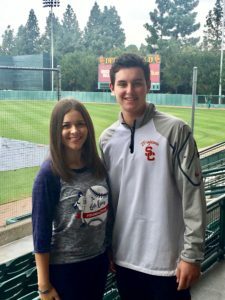 Meet CJ Stubbs, our first USC Lats Legacy Baseball Scholar! The Lats Legacy Foundation is proud to announce 2017 USC Lats Legacy Baseball Scholar, CJ Stubbs. 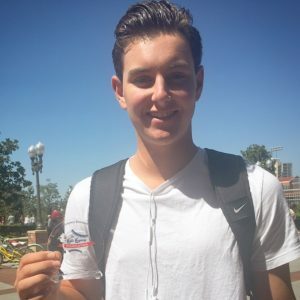 The right -handed Trojan Baseball pitcher/catcher is a sophomore from Southern California who embodies the commitment to baseball and academics that LATS was known for. I’m a Sophomore Business Administration major from Del Mar, California. I want to potentially get into doing a technology commercialization minor. I have one brother who went to USC and is now with the Astros. My favorite thing about being on the baseball team here is the group of guys that we have. It’s cool how all of our guys are recruited from the same area. We only have two guys on the team who are from out of the state, so most of our guys come from Southern California and we all just find our way and click really easily. My favorite thing about baseball is the strategy and the little things behind it. A lot of people see baseball as a slow and boring sport, but there are so many things that go into each pitch that you don’t see. It’s an art. I’m a pitcher. I used to catch, but now I stick to pitching. We created The Lats Legacy Foundation to honor a USC baseball player who exemplifies the two characteristics that distinguished my father: leadership on the field and academic excellence off the field. What does it mean to you to be our first scholar? My family has always taught me that school comes first. I know that getting drafted would be great, but finishing out my four years here and getting that degree and then potentially pursuing my dream of becoming a professional baseball player is second to getting a good education. Also, one thing I want to do after I graduate is get my real estate license and potentially join my mom in her company. How do you balance baseball with academics? It’s tough. Baseball consumes most of my day. One thing that I try to do is attend as many classes as I can. Obviously my grades will take a hit here and there because I’m always traveling. I’ve learned that if you can just make the effort to go to class and talk to your professors, they’re going to help you out as much as you’re helping yourself out. The dream is to play professional baseball and hopefully make it to big leagues. Other aspirations I have are potentially get into real estate, or hopefully within the next couple years here a bright idea will pop into my head and I can potentially create my own company and use my business degree. What advice would you offer to young athletes who want to play baseball in college? From an academic standpoint, school comes first. Try to maintain a 3.5-4.0 GPA in high school and you’ll set yourself up to go to a good school like USC where you can play baseball for a great program and get that great degree. Also, I would say that you can never do too much off the field. There’s so much – even just working out is important. It’s hard to do when you’re not being forced to. In high school, if you’re working out just a few times a week, it’s going to help you immensely once you get to college. Congratulations CJ! We can’t wait to see what the future holds for you. Fight On!